I listen to worship music often. Actually, that is what I listen to most of the time. Last week my iPod was dead and I never got around to charging it. By the end of the week my emotional and spiritual bucket was pretty empty. The light finally clicked on that I hadn't been listening to music on my very long drives to and from school and to and from meetings I had during the day. To put it in perspective, each week day I spend almost 2 hours (sometimes more) in the car. That's a long time if you ask me. Therefore, music about Jesus' greatness and glory is a must. Focusing on Him lifts my spirit because it gets my mind off myself, circumstances, to-do lists. Worship music in my life puts Ephesians 4:8 into tangible action... whatever is true, right, noble, pure, lovely, admirable, excellent, or praiseworthy, think about such things. The only thing I know that fits all those categories is Jesus. That is one of the reasons I love worship music. 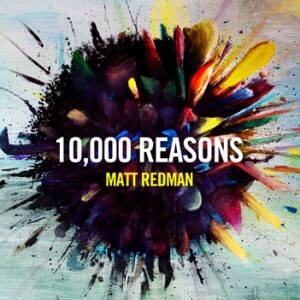 Matt Redman has a new album out called 10,000 Reasons. You really should buy it. Go to iTunes or your music store of choice and get it. I usually love 3 or 4 songs off every worship album I buy, but this one is different. On iTunes you have to buy the album to get the song Holy and you really, really need this song. Oh, it is good. The lyrics in all the songs are so focused on God. Every once in awhile songs come along that move me so deeply to ponder the character of God, and this album is full of these songs. I can't even tell you which one is my favorite because I love so many of them! Just buy it. Please. If you would like to hear insight into the album from Matt Redman himself go watch this video. Or if you want to listen to the title song which is amazing go watch this video. Let me know what you think of the album. I pray God uses it to encourage your heart and magnify Him in your life the way He has used it in mine. Yeah it's awesome. I am probably going to do a commentary about why Matt Redman shows in this album why I like him best of all modern worship leader/song writers on my worship blog (when I get around to it). Havent heard it yet but cant wait to! Recently put my radio back to my Christian music station. I am also in the car a lot back and forth to the school and it really does fix your mood and therefore your spirit. I know just what you mean Angel. I went through a phase where I just didn't want to listen to KLOVE. But now I always put it on when I'm not listening to my iPod. But I have to listen to worship music on my way to work every morning. It makes such a big difference in my attitude. And goes along with the verses I've been memorizing. Thanks for sharing your heart!